The people have spoken... The November People's Choice Award goes to Maury Zeff for his short musical, Love Spacewalked In, presented as a staged reading at the capacity-crowd Monday Night PlayGround Musical Theatre Night on November 18 at Berkeley Rep. Congratulations, Maury! Courtesy of Mr. Zeff, we're pleased to share the first two pages from the award-winning script. Enjoy! LIEUTENANT KIP STRONGBOW – Astronaut – Male – 40s – Any race –All-American astronaut made from the Top Gun fighter pilot mold. He spent much of his astronaut career earthbound, since NASA’s budgets dried up just as he reached his prime years. He is thrilled to get this crack at a mission before he is too old to be sent into space. Realizing that this may be his first and only space mission, he hopes to squeeze as much glory out of it as possible. CAPTAIN NORMAN “BUZZ” GLICKSTEIN - Astronaut – Male – 30s or 40s – White – In the vein of the great astronaut-nerds who willed their way into space through sheer intellectual horsepower, Norman has always excelled at the more cerebral aspects of the job. Not so much the physical demands. He absolutely hates zero gravity. Please call him “Buzz,” although nobody does. HOUSTON – Disembodied voice – Male – Any age – Any race – The ubiquitous Houston control center voice from every NASA-related space movie you’ve ever seen. Should be crackly and officious. On top of being efficient-sounding, Houston is morose. His girlfriend recently dumped him. Until his conversation with Valentina on page 7 turns flirtatious, Houston should speak in the desultory tones of a broken man. RAFAEL DUNWOODY – Mogul – Male – 20s or 30s – Any race – Founder of a global conglomerate of media properties, telecommunications companies, Internet businesses, airlines, and a space exploration company. He is an adventurer of the highest order, a risk-taker extraordinaire, and an egomaniac par excellence. He has been invited along on this mission in the interest of promoting greater collaboration between NASA and private industry. 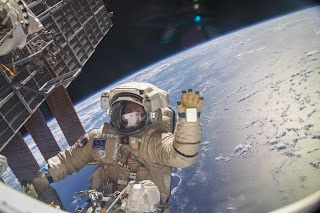 LIEUTENANT VALENTINA BLAZHENOV – Cosmonaut, technical wiz, zero gravity handiwoman – Female – 20s or 30s – White, with a Russian accent – Valentina is the hardest working person in the interplanetary space business. She is the personification of “If you want a job done, do it yourself.” Whether it’s reprogramming a dust collection satellite or hanging pictures that won’t look crooked in zero gravity, she’s your cosmonaut. She is also an intergalactic femme fatale, turning spacemen’s helmets wherever she goes across the galaxy. She has worked hard to achieve this level of skill and recognition, but she has not given herself enough ‘Valentina Time’: She almost never gets to her parents dacha in the country on weekends, rarely stops to smell the chamomile, and has not taken the time to find the right petro-oligarch to settle down and have little Sputniks with. Note about the music: When Kip sings the first few lines of the song on page 3 and Norman does the same on page 6, they should sing it in the torchy style in which it was recorded in the 1930s. But during the bigger musical number, the cast should sing it in the more upbeat style in which Frank Sinatra recorded it in 1961. SETTING: Five miles above the lunar surface. The Pluto 1 is orbiting the moon, tracking the movements of an unmanned specimen collection module that has been sent down to explore and collect samples of lunar dust and rocks. The astronauts have been in space for three weeks and are getting a little sick of each other. They are in zero gravity. CAPTAIN NORMAN “BUZZ” GLICKSTEIN and LIEUTENANT KIP STRONGBOW sit at different places in the spacecraft. They are “strapped” to their seats. When people move around the spacecraft, they should “float” as astronauts do in zero gravity. Actors should have fun with the simulation of a gravity-free environment, remembering that they will also have to use their hands to bounce off the “ceiling” and “walls” of the craft as they walk/float around. New coordinates coming in from Pluto 2 on the lunar surface. 30 degrees longitude, 47 degrees latitude. Okay, at 32, 49, have Pluto 2 collect another sample of rocks and dust. (Into the “microphone.”) Houston, this is Captain Buzz Glickstein on Pluto 1. We are collecting lunar samples at 32 long and 49 lat. Pluto 2 is operating smoothly. All systems are go. I repeat, all systems are go. Over. Houston, this is Buzz Glickstein on Pluto 1. Copy. Over. (To KIP.) What’s wrong with him? You are not going to have a Neil Armstrong moment where you get to say something profound. Americans will not be gathered around their TVs waiting for transmission of us sorting through moon dust. And, anyway, you’re totally plagiarizing Armstrong. All great literature is derivative. Armstrong copped it from Churchill’s ‘We will fight them on the beaches’ speech. No, he didn’t. Space travel wasn’t exactly front of mind during the Battle of Britain. I have one request: When the transmission goes live, can I make the announcement to the world? Kip…Lieutenant Strongbow, our mission has been christenened Pluto 1. We are named after a downgraded former planet. (Pause.) We are in space, collecting rocks that will be catalogued at NASA to reveal the same minerals we’ve been studying for decades. I wish this was a more high profile endeavor, but it just isn’t. We will land, the doctors will check us out, we will drive home on I-95 to our suburban homes, and the minivan drivers in the next lane will have no idea that we were orbiting the surface of the moon only two days earlier. Don’t you think there should be more to it though? More, I don’t know… More recognition…More humanity. Yes, more than just flying around collecting rocks. It should matter to someone other than geologist nerds in some laboratory. This trip should somehow change us, make us better. Opening bars to ‘Love Walked In’ begin to play. NORMAN looks thoughtful. RAFAEL DUNWOODY zero gravity-walks in. Join us for the next Monday Night PlayGround on Monday, December 16, at Berkeley Rep and choose your own favorite. Click here for more info. PlayGround's 5th Annual Musical Theatre Night: S'Wonderful! S'Marvelous! S’wonderful! S’marvelous! 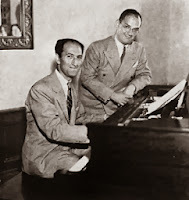 PlayGround writers will draw from the music of George and Ira Gershwin for their inspiration for the fifth annual Monday Night PlayGround Musical TheatreNight, taking place at 8pm, Monday, November 18 at Berkeley Repertory Theatre. Writers have four days to generate their original scripts, inspired by some of the greatest music written for the musical theatre, including Embraceable You, Fascinatin' Rhythm, Lady Be Good, Let's Call The Whole Thing Off, Our Love Is Here To Stay, S’Wonderful, and They Can't Take That Away From Me, among others. Performed on the set of Berkeley Rep’s current show, The Pianist of Willesden Lane, the Monday Night PlayGround performances will include accompaniment by noted Bay Area pianist and arranger Steve Sanders, currently working on The Gershwins’ Porgy and Bess at the Golden Gate Theatre. Tickets and discount season subscriptions can be purchased online at http://playground-sf.org/boxoffice. PlayGround audiences get to enjoy a unique behind-the-scenes perspective, with a free Pre-Performance Discussion at 7:10pm. Audience members can also experience the thrill of being a producer through the monthly People’s Choice Awards, helping to determine which plays and playwrights go on for consideration in PlayGround’s annual showcase, the Best of PlayGround Festival. PlayGround, the Bay Area’s leading playwright incubator, provides unique development opportunities for the Bay Area’s best new playwrights, including the monthly Monday Night PlayGround staged reading series, annual PlayGround Festival of New Works, full-length play commissions and support for the production of new plays by local playwrights through the New Play Production Fund. To date, PlayGround has supported more than 185 local playwrights in the development and staging of over 650 original short plays and 48 new full-length plays, with 3 more commissions currently in development. For more information, visit http://playground-sf.org. WHAT: Occurring monthly, October-March, the popular Monday Night PlayGround series presents staged readings of thematically-connected short works by the Bay Area’s best new playwrights each month at Berkeley Repertory Theatre, staged by leading local professional actors and directors. For November, PlayGround will present six original short plays inspired by the music of George and Ira Gershwin, performed with live accompaniment by noted Bay Area pianist and arranger Steve Sanders (1776, The Gershwins’ Porgy and Bess). TICKETS: $15, available online or at the door. Pay-What-You-Can at the door beginning one hour before the performance, subject to availability. 6-pack flex subscriptions are just $60 (50% off priority seating). For more information about the Monday Night PlayGround series, call (415) 992-6677 or visit www.PlayGround-sf.org. 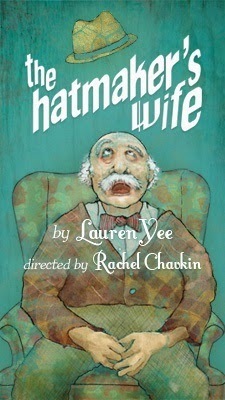 Lauren Yee's play THE HATMAKER'S WIFE received its Off-Broadway premiere in September, produced by Playwrights Realm. The Goodman Theatre just commissioned her to write KING OF THE YEES, supported by the Virginia B. Toulman Foundation. Steven Westdahl has joined the flagship ensemble of the new SF Neo-Futurists and will soon begin performing 50 weekends a year while continuing to host and produce the monthly Write Club SF and Shipwreck literary competitions. Cindy Goldfield starts rehearsal directing SNOOPY!!! at 42nd Street Moon, and also begins her 10th year with A CHRISTMAS CAROL at A.C.T. Madeline Puccioni's WALLS OF TROY will be performed November 21 at the SF Olympians Festival at the Exit Theatre. Alex Moggridge is currently in NYC understudying BETRAYAL on Broadway, starring Daniel Craig and Rachel Weisz and directed by Mike Nichols. It's been quite a ride! Zoe Young has recently joined the editorial team of the literary magazine The Bensonhurst Review. She will be co-editing the poetry section. You can read a short prose piece of Zoe's entitled "Moni" in this Month's issue at http://thebensonhurstreview.com. Ellen Koivisto’s First Class is to be published by Bare Fiction magazine, http://www.barefictionmagazine.co.uk. Arisa White received a cultural funding grant from the City of Oakland to create the libretto and musical score for Post Pardon: The Opera, in collaboration with NYC-based composer Jessica Jones. Karen Macklin recently participated in the Portuguese Art Colony's Live Writing event at The Make-Out Room. Rebecca Pingree will be performing in The SF One Minute Play Festival, Dec 14-15 at Thick House. Rachel Bublitz's full-length play, UNDER THE GODS' GOLDEN CLEATS, is getting a staged reading at The Exit Theatre on Saturday, November 9th at 8pm, part of the 2013 San Francisco Olympians Festival. Visit the event page for more information or to RSVP: https://www.facebook.com/events/166435956886604/.